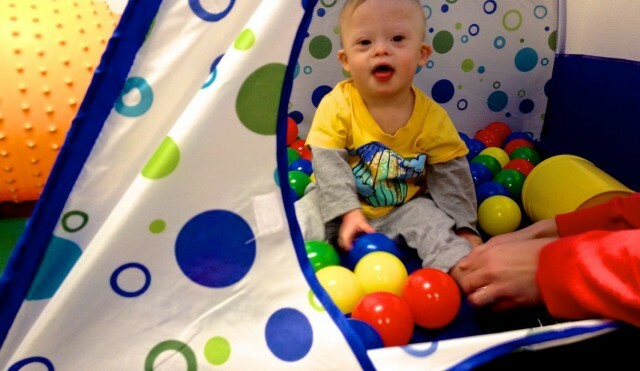 How To Make A Ball Pit For Your Child With These Cheap And Easy Tips! You are here: Home / Therapy / Noah Has A BALL In The Ball Pit, And 2 Ways You Can Make Your Own For Cheap! Work? This is child’s play! For instance, Noah could be thinking he’s just playing a fun game, but he’s really learning how to grasp! Other times he could think he’s just playing with a ring stacker, but he’s really learning how to transfer objects! And when he thinks he’s just playing with a ball, he’s really learning how to sit. We’ve all been tricked…and it’s ok! Since becoming a parent I’ve learned that many of my favorite childhood activities actually served a dual purpose; the swing set, the slide, and today I found out that even the ball pit *gasp* are good for you! But not only was he having fun, he was unknowingly working on his gross motor skills. (Shh…I don’t tell him, if you don’t!) 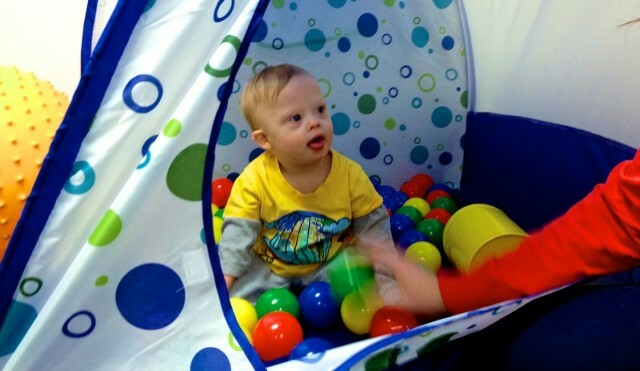 Additionally, the ball pit helps children with low muscle tone, like Noah, strengthen their core as they work against the balls while playing. Noah’s occupational therapist suggested that we make our own ball pit by purchasing a small inflatable kiddie pool and a bag of plastic balls. You may already have a blow up pool around your house, and if that’s the case all you need is this 100 pack of Fun Ballz and your all set! Our friend Kelle is great at coming up with super creative (and easy) ways to save money on kid stuff. As I was telling her about the inflatable pool idea, she mentioned that she had used her Pack ‘N Play as a ball bit. She already had the Pack and Play, so she simply filled it with some plastic balls and bam, she has an instant ball bit. Genius! Do you have a ball pit at your house? If so did you make it on your own, or buy one from the store? What are some of the ways you’ve creatively saved money on kids toys by making them yourself? Leave a comment below and tell us about it. (Bonus points for sharing pictures!) And if you end up making our own ball pit, be sure to come back and let me know (and share a picture.) I’d love to see what you come up with. what about a kids little tent or a small 2 person tent n fill it with balls then you n mommy can get in there with lil man n have family ball pit night /day . that is what im gonna do for my kids . noah loves his ball pit i can tell . That’s a fun idea! Let me know how it goes when you end up doing it! Declan and I make card board cars out of shoe boxes, or cereal boxes etc…it then doubles as something to draw all over as you decorate the car:))….I’ll need to remember where I put the shot of him with it, so i can show you:). We haven’t tried the ball pit, great idea though! That’s awesome! Noah’s got a big cardboard play house in his play room also. What a fun, creative, and cheap way to play. And please do share a photo! We’d love to see. Thanks for your comment! What other sorts of activities do you suggest that are easy for parents to do at home? We have (had) a small tent that Timothy used to sleep in when we went different places when he was small. Same shape and same size as what is viewed here. That would be perfect. He would still like to use it but he is really to big for it anymore. PT’s often come up with ideas on their own. I really think they make it up as they go along. Great ideas. You’re right, a tent works well also. And I agree, sometimes it does seem like they are coming up with activities as they go along. But they always seem so helpful and intentional. So it’s all good. Wow, it sounds like it’s dual purpose! My favorite type of toy! By the way, do they have special plastic balls, or can you wash all toy balls like that in the washing machine? My 4 year old has hypotonia as well as some developmental delays. I love the ball pit idea! We too have been using the exercise ball to help strengthen his core. The exercise ball is great stuff. 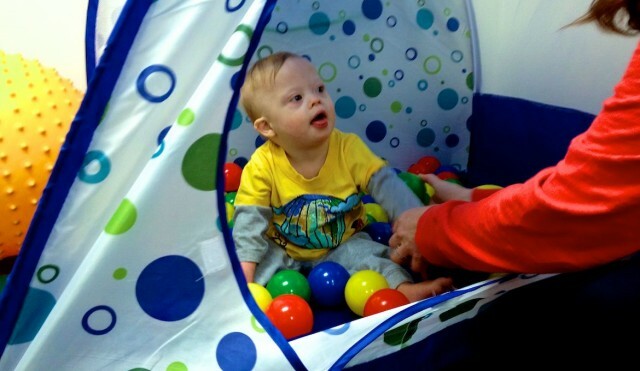 We have several videos on our site of Noah using the exercise ball as well. It has really helped him a lot! The ball pit idea Is great. Maybe keep in mind that the small children’s pools go on sale near the end of the summer and so do the beach balls, cloth pool water balls, plastic fish and fishing poles and summer play toys. Maybe stock up on those as fun therapy tools for the winter when it is too cold to play outside. Plus, I would think blowing bubbles would be good for speech therapy and maybe fine motor skills-bet those are on sale at the end of summer too. Very fun! Did she end up getting the ball pit?